I am off on a girlfriend Road Trip with a great friend of mine. We are heading 3 hours south of where we live to the Hobnob Spring Market. I have never done this market but we girls needed a road trip to catch up and some fun shopping so tomorrow I will be headed to this Market. 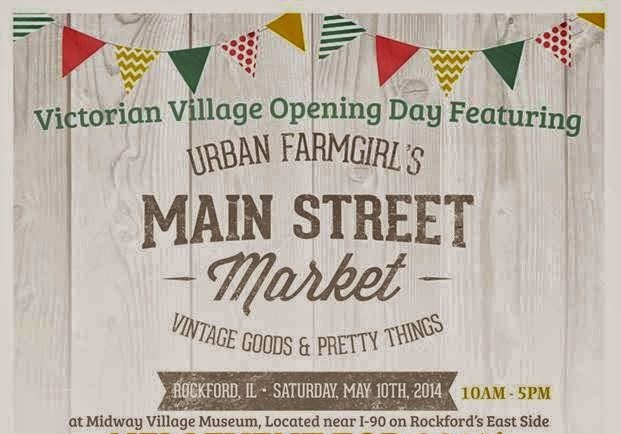 On Saturday we are heading out to Rockford, Illinois for Mary's Urban Farm Girl Main Street Market. She is hosting 78 fabulous vendors and it will be throughout the Victorian Village at Midway Village Museum. I cannot wait. So I will be off blog land for a few days. Please be sure to tune in on Saturday for Spotlight. Susan and I have two fantastic bloggers for you to get to know. Have a fantastic week end and a beautiful Mom's Day. Enjoy. I am sooooo JEALOUS!!! I would love the chance to go to Mary's show, I'm sure it's going to be great!!! She has some very talented vendors on her list. Now, I've gotta check out this other show. Hope you have a wonderful time and HAPPY MOTHER'S DAY!!! Oh how wonderful to be able to go to 2 markets in such a short amount of time!....Have fun and hope you find lots of great things!!!.. Mary has some great stuff!! Have a ball, Kris! Sounds like so much fun and I'm looking forward to seeing your finds! Sounds awesome...I know you will have a great time. I can't wait until the 17th of May...that is when the big flea market and antique show is here in town with the Vintage Marketplace. Sounds exciting and sooooo much fun. Enjoy, adventures with girl friends are always filled with laughter and fun. The thrill of the hunt and the joy of the find. Happy Mothers Day weekend. That sounds exciting, Kris. Have a save trip and lots of fun! So, so envious. I wish I could find out about these shows. I'm. Retired ...could easily go. I could so easily take Leila Jane along! Have a wonderful time, Kris! Two markets are better than one! Wishing you a very Happy Mothers' Day. What fun!! I bet you will fill the vehicle! How fun! Enijoy the trip. I'll wait for you to see your great finds! My kind of Mother's Day! Wow, what a fun weekend! Shop till you drop (off your feet, not all your cash!). Can't wait to see what you get. No way! What fun! This GA girl has got to get out of here.